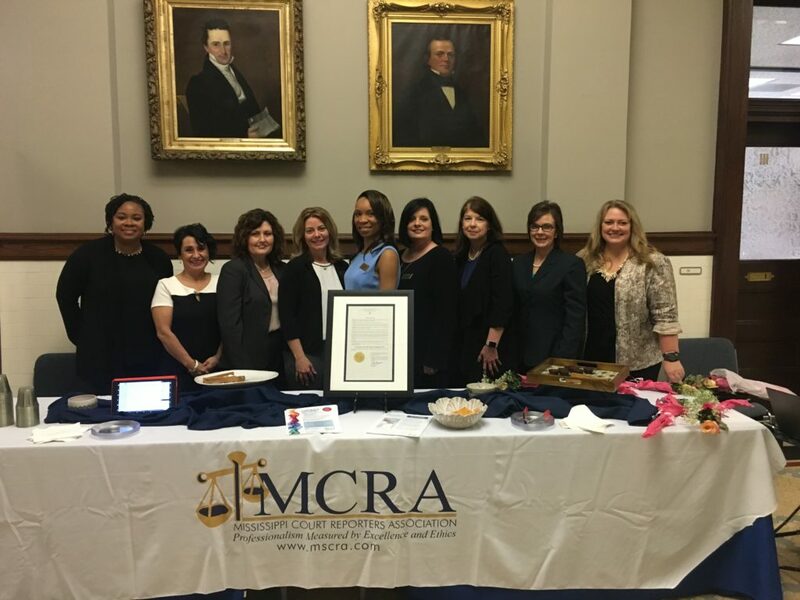 Social media shares, careers showcased in the press, official proclamations, memes, open houses, and more have marked NCRA’s seventh Court Reporting & Captioning Week celebration happening Feb. 9–16. The weeklong event is designed to help promote the court reporting and captioning professions to the public by hosting demonstrations, open houses, and more. At the national level, U.S. Rep. John Shimkus from Illinois recognized the week in a written speech submitted for the official record of the U.S. House of Representatives. In addition, U.S. Rep. Rodney Davis from Iowa delivered a similar speech from the House floor on Feb. 14, recognizing the event. 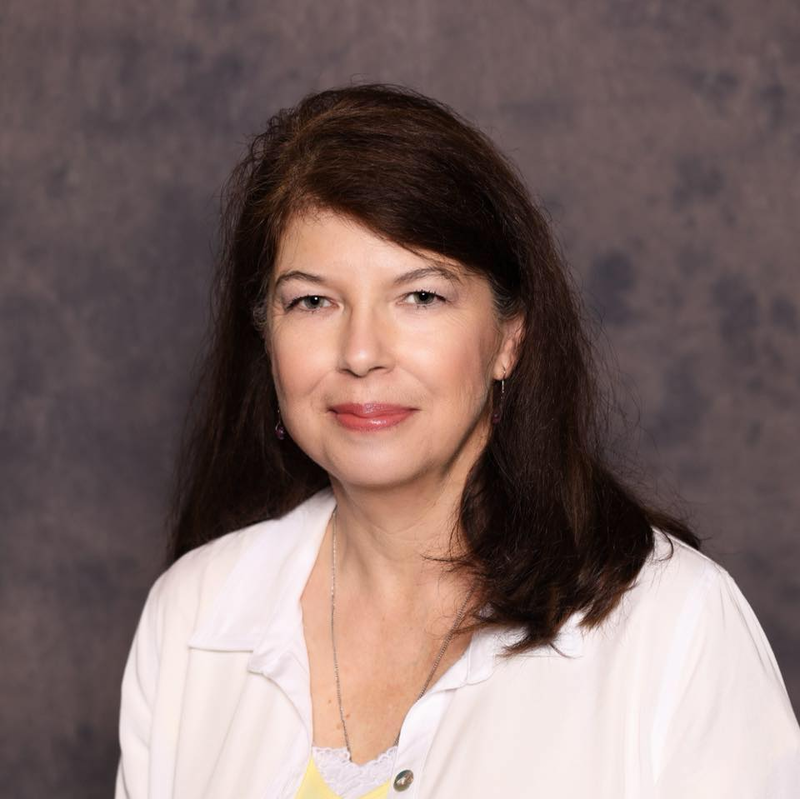 On Feb. 12, NCRA President Sue A. Terry, FAPR, RPR, CRR, CRC, participated in “Spread the Word,” an online event hosted by the College of Court Reporting in Valparaiso, Ind., in honor of 2019 Court Reporting & Captioning Week. Terry joined other representatives from the court reporting and captioning professions to talk to students firsthand about the benefits of a career in court reporting or captioning. The speakers also provided motivation and inspiration to those who attended and participated in a Q&A segment. “It was a fantastic event for the attendees,” said Terry. “Watching the chat window, you could tell they appreciated the information and were inspired by the many presenters. The presenters were given the opportunity to craft their own messages and topics. This was a great idea because you could tell each participant was speaking from their heart. It was an honor to join this group of dedicated professionals in giving back and motivating the next generation of reporters,” she added. State associations, individuals, and students have also taken to social media outlets to celebrate the week. In addition to sharing memes, professionals have also been sharing why they love their careers, information about special events happening in their areas, and more. The Deposition Reporters Association of California shared via email with members a video of a keynote speech delivered by its lobbyist and attorney, Ed Howard, at its 2017 annual convention, where he told reporters why they are amazing. In honor of the week, NCRA also launched a series of videos featuring members talking about why they love their careers. The videos are available on NCRA’s YouTube channel. 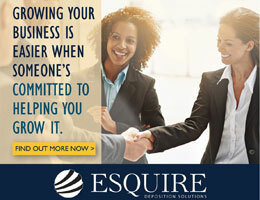 State associations, members, and schools are encouraged to share them to help promote the court reporting and captioning professions all year round. The Captioning and Court Reporting program at Cuyahoga Community College (Tri-C), Cuyahoga, Ohio, held its annual write-a-thon fundraiser in celebration of the week. Students in the program gathered in a prominent area of the school plaza and worked together on their machines as a visible display of the court reporting profession in training. Students secured sponsors ahead of time to contribute funds to support student members attending professional development activities such as state and national conventions. In addition, Tri-C students in the program hosted a “Professional Pop-Up” interactive career event, which featured professional reporters from a variety of court reporting and captioning sectors who displayed their skills through demonstrations of live reporting and captioning. The event was followed by a Q&A session. Court reporting and captioning students at Madison College, Madison, Wis., manned a two-day table in the school’s cafeteria where they practiced writing on their machines and talking with visitors to the table. In addition to the students, instructors were also on hand to talk about the career and the many opportunities available for those who choose it. 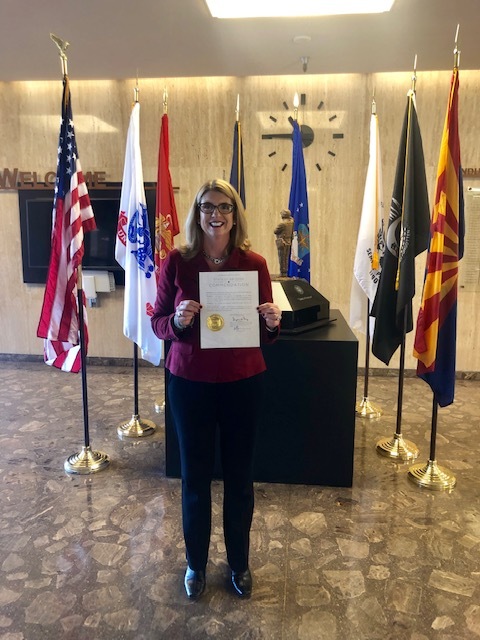 Official proclamations from Pennsylvania and San Antonio, Texas, were also reported later in the week bringing the total number of proclamations to 16. On Feb. 9, KIIITV, Corpus Christi, Texas, aired a story that featured faculty and students from the Del Mar College’s court reporting program showcasing the court reporting and captioning professions. On Feb. 11, channel KSAT, San Antonio, Texas, aired a story that recognized court reporters for their work. 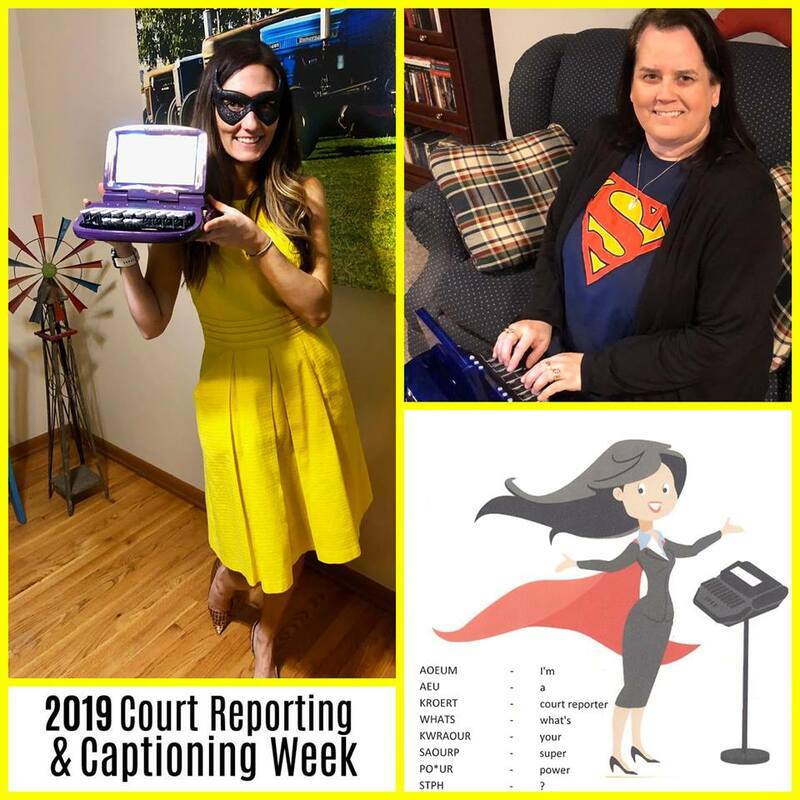 The story included an interview with NCRA member Carol Castillo, an official court reporter, from the steps of the Bexar County Courthouse in honor of 2019 Court Reporting & Captioning Week. 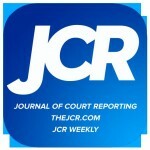 NCRA member Kaylee Lachmann, RPR, a new court reporter with Planet Depos, was profiled in a blog posted by JD Supra on Feb. 13. 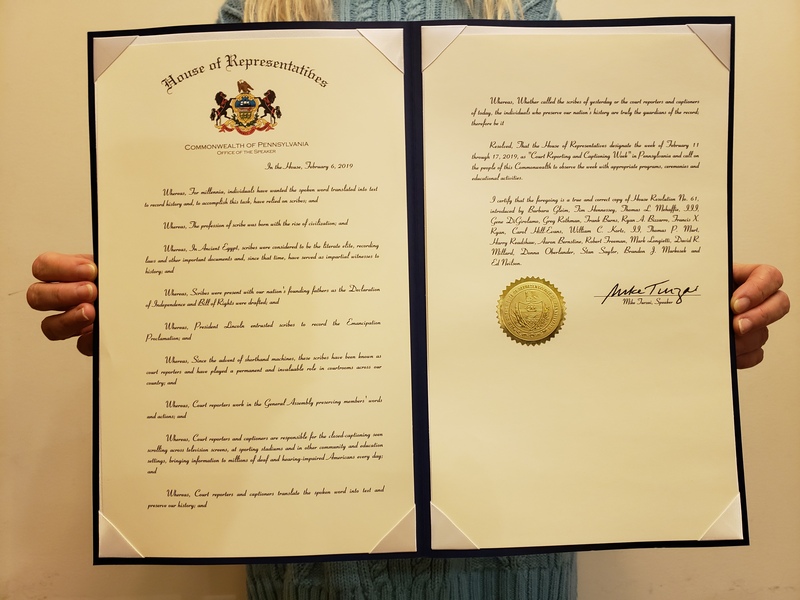 This year, NCRA has issued its own challenge as well: It calls on all state affiliates to help celebrate this year’s Court Reporting & Captioning Week by securing an official proclamation recognizing the week by their state governor or a state lawmaker. 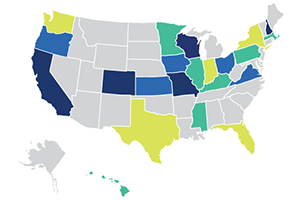 States that submit a copy of their official state proclamation to pr@ncra.org will be entered into a drawing to win one free 2019 Convention & Expo registration. 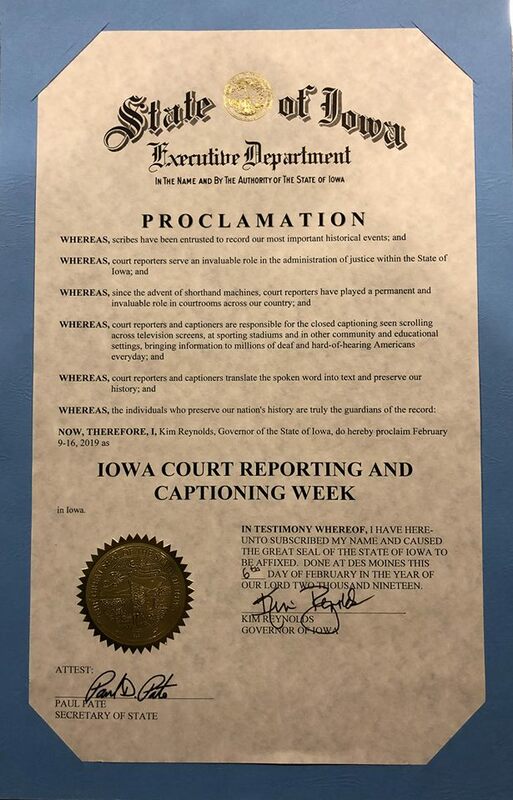 Read more about what others are doing to celebrate NCRA’s 2019 Court Reporting & Captioning Week. In a press release issued Feb. 12, Huseby, based in Charlotte, N.C., announced the acquisitions of Edwards Reporting in Jackson, Miss., King Reporting in Melbourne, Fla., and Ruffin Consulting, in Raleigh/Wilmington, N.C.
NCRA’s weeklong National Court Reporting & Captioning Week kicked off Feb. 9 with state associations, schools, and firms sharing how they are celebrating the week. 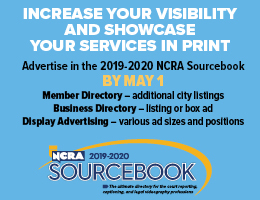 This is the seventh year NCRA has hosted the event designed to help promote the court reporting and captioning professions to the public by hosting demonstrations, open houses, and more. At the national level, U.S. Rep. John Shimkus from Illinois recognized the week in a written speech submitted to the U.S. House of Representatives’ official record. In addition, U.S. Rep. Rodney Davis from Iowa is expected to deliver a similar speech from the House floor later in the week recognizing the event. The California Court Reporters Association (CCRA) is hosting several events throughout the week for its members including a “Spread the Love” submission contest via its Facebook and Instagram outlets with a prize of a one-year association membership. CCRA members are also encouraged to share their steno talent at a career fair or volunteer to mentor a court reporting student to mark the week. Throughout the week CCRA will also dedicate one day each of social media posts to highlight members who are official court reporters, captioners, and freelancers. The freelancers’ day will also feature a digital “mixer” via Facebook where freelancers can connect and chat. CCRA is also auctioning off a new ProCat writer on its Facebook page and is hosting a live broadcast about NCRA’s A to ZTM Intro to Steno Machine Shorthand program. 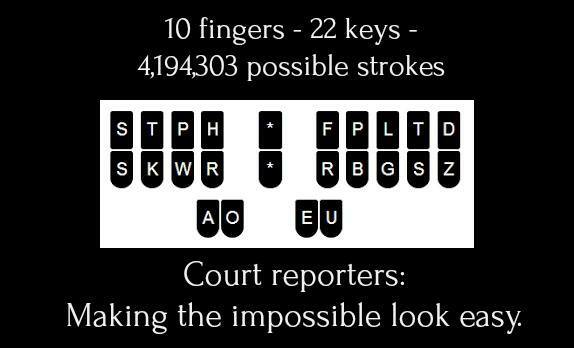 “Court Reporters, the Eighth Wonder of the World,” is a poster the Florida Court Reporters Association has developed for its members to display in their courthouses and offices. The poster provides information about broadcast captioners, CART providers, realtime captioning, and court reporters. President of the Kansas Court Reporters Association (KCRA) Jennifer Olsen, RPR, CRI, an official court reporter from Topeka, and other association members marked Court Reporting & Captioning Week with a presentation to local county commissioners in Shawnee County in Topeka. KCRA members will also be handing out information and treats all week to attorneys, judges, court staff, administration staff, and building staff in at their courthouse. 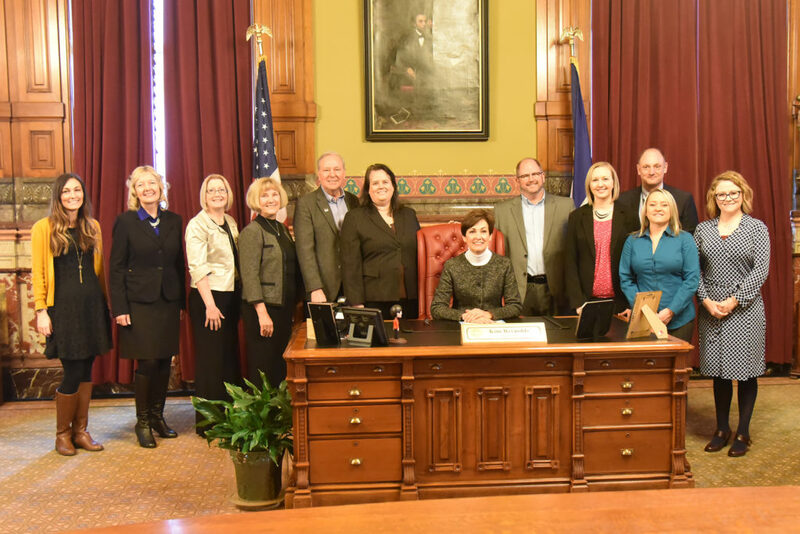 In Iowa, members of the Iowa Court Reporters tagged NCRA in one of their Facebook posts, and to date it has reached more than 22,500 people and generated more than 3,500 engagements and 220 shares. 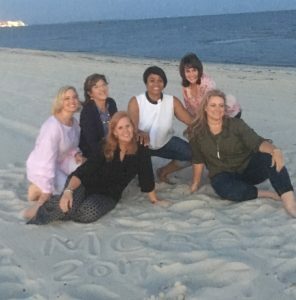 In addition, members are posting daily photos of their board members in super hero apparel and encouraging others to share photos of themselves with their machines either with or without super apparel. 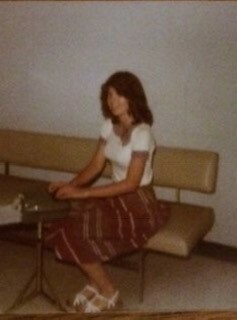 President of the Ohio Court Reporters Association (OCRA) Terri Sims, RDR, CRR, an official court reporter from Clinton, Ohio, submitted a letter to the editor to all major newspapers in the state about the important work court reporters and captioners provide. In addition, OCRA members are being invited to participate in a Sip & Paint social event being held on Feb. 17. In Oklahoma, members of the Oklahoma Court Reporters Association are hosting “A Day at the Capitol” for legislators that will include live demonstrations by court reporters and captioners as well as speakers. Anoka Technical College in Anoka, Minn., is hosting an on-campus Court Reporting & Captioning Exhibition in conjunction with the Minnesota Association of Verbatim Reporters & Captioners. The event will feature demonstrations of state-of-the-art technology, tours of the school’s captioning lab, and short presentations. In addition, industry leaders representing realtime captioners and court reporters will also be on hand for the festivities. There will also be pizza, steno cake, coffee, soda, and prizes. Faculty from the court reporting and captioning program at Green River College in Auburn, Wash., have tasked students with going out into the community and setting up their machines, practicing, and taking photos to try to spread the word about how great a career in court reporting or captioning is. Students will also be armed with information and be posting on social media throughout the week. In addition, one student will be traveling to Italy with her machine and will provide pictures. The photos will then be collected and used for a calendar. To further help students celebrate the week, Byers & Anderson, a court reporting firm in Tacoma, will be hosting a tour of its facilities and host a brunch and a Q & A session with working professionals. 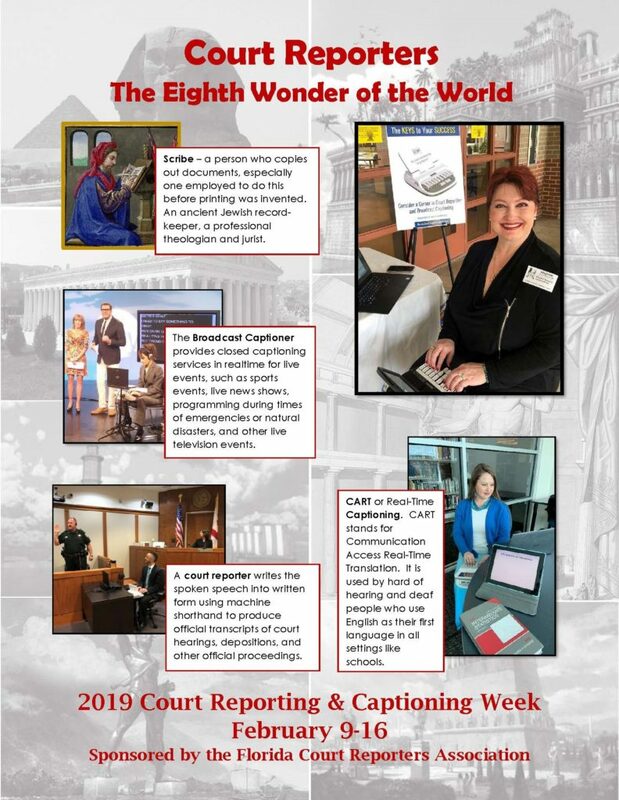 AB Court Reporting & Video in Denver, Colo., branded a flyer designed by NCRA to help promote the week and the important work that court reporters and captioners do that the firm will share on its social media outlets throughout the week. For the second consecutive year, Planet Institute, a division of Planet Depos, based in Washington, D.C., is offering three $1,000 scholarship opportunities to qualified students and recent graduates of the nation’s court reporting schools. Those who qualify to apply for one of three $1,000 scholarships are, specifically, students near completion of the program or who completed a court reporting program within the past three months. For additional resources, visit NCRA’s Court Reporting & Captioning Week resources page. No matter how you celebrate 2019 Court Reporting & Captioning Week, be sure to share your stories and photos with NCRA’s Communications Team at pr@ncra.org. On Aug. 19, The Dispatch reported that the Mississippi 16th Circuit judges are seeking a pay increase for their court reporters. WCBI, Lowndes County, Miss., reported on Aug. 16 that the state of Mississippi is experiencing a shortage of court reporters.